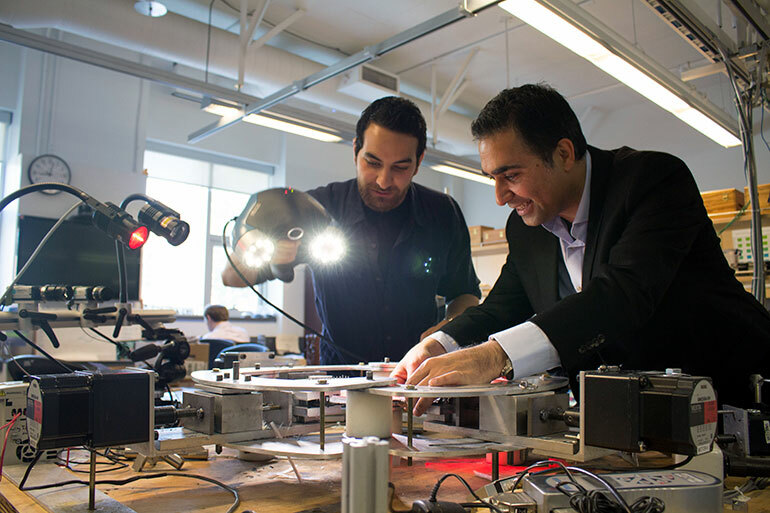 Engineering professor Abbas Milani and graduate student Armin Rashidi use 3D scanning equipment to analyze textile composites. While wearing a crisply ironed, wrinkle-free shirt makes a good impression, researchers at UBC’s Okanagan campus are working to solve the issue of wrinkling when it comes to making textile composites. Textile composites are known for their strength and durability. But as Abbas Milani, a professor in UBC Okanagan’s School of Engineering explains, a simple wrinkle in the manufacturing process can significantly alter the end product—sometimes diminishing its strength by 50 per cent. Milani says wrinkling is one of the most common flaws in textile composites, which are widely used for prototypes, as well as mass production within prominent aerospace, energy, automotive and marine applications. To iron out the problem, researchers at UBC’s Composite Research Network-Okanagan have investigated several de-wrinkling methods and have discovered that they can improve their effectiveness by pulling the materials in two directions simultaneously during the manufacturing process. They did this by creating a custom-made biaxial fixture—a clamp that stretches the textile taught and removes unwanted bumps and folds. The research included stretching the material and then using specialized image processing and 3D scanning to analyze the required forces and its impact on the wrinkling and de-wrinkling of the material. It is important for designers to be able to predict the right amount of force needed to diminish the wrinkles in the final product, explains Milani. To do this, his team of students has created a multi-step test to assess the magnitude of the required forces needed to smooth out wrinkles of different sizes that were formed at different shear angles of a comingled fibreglass-propylene plain weave fabric. The research, recently published in the Materials & Design journal, was partially funded by the Natural Science and Engineering Research Council.